Complex Systems are the full flowering of Continuing Creation here on Earth. Complex systems include crystalizing minerals, simmering water, tornadoes, a one-celled bacterium, bird flocks in flight, human bodies, the brain, bicycles with riders, money, governments, ecologies, religions, bodies of law, steel mills, computers, music, the Way of G>O>D> itself, and the entire universe it is creating. Why are Complex Systems vitally important to the Way of Continuing Creation? Because they show how Continuing Creation itself takes place. Continuing Creation (which we also call The Way or Path of G>O>D>: The Growing> Organizing> Direction of the Cosmos) is itself a Complex System. It both describes and is described by all the principles and processes we will talk about in this Essay. This Essay is where we peer into the mechanics of the one and only miracle of the universe, which is Continuing Creation of G>O>D>: The Growing> Organizing> Direction> of the Cosmos. Understanding these natural processes dispels the need for us humans to weave fictional explanations involving magic and supernatural beings. We’ll start by describing a few examples of complex systems – a living thing (or things) called the slime mold, mineral crystal formation, simmering water, tornadoes, ant colonies, and free-market economies. For each one, we will mention a number of its important system properties and processes. Then we’ll talk more about why such systems are important for the Path of G>O>D>. We will go on to present additional examples of complex systems and discuss important general aspects of complexity in greater detail. When food supply, temperature and humidity are favorable, the slime mold lives as separated, individual cells. But when conditions are strained, these cells coalesce to form a single, larger organism. Time lapse photography shows that the organism then crawls very slowly along the forest floor in a unified search for food. When its environment improves, the cells separate and become solitary foragers once again. 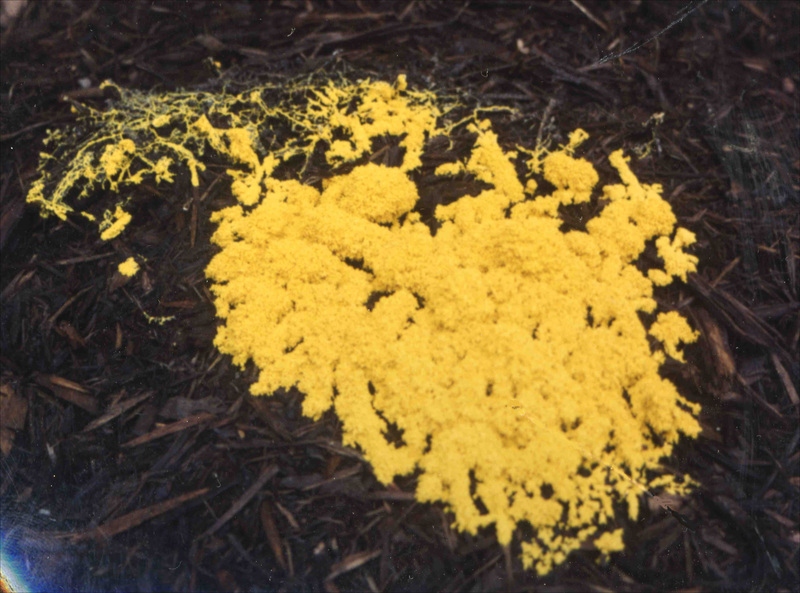 The formation of the larger slime mold is a prime example of emergence, and self-organization in complex systems. It is a “bottom-up” (i.e., not centrally directed) creation of a new and different whole out of the interaction of simpler, identical parts. The self-organization process of the slime mold involves communication (the pheromone trails), just as exploring worker ants communicate as they mark out the way to a good food source for the columns of ants who follow after them. Complexity Science is the scientific study of complex systems, systems with many parts that interact to produce global behavior that cannot easily be explained in terms of interactions between the individual constituent elements. In the last half-century, the Science of Complexity has revealed many characteristics and features of complex systems, including hierarchy, feedback loops, triggers, cascades, self-organization, emergence, homeostasis, adaptation, and many others. We will describe these and many of the others in our Essay, taking care to bold-underline the name of each characteristic as we discuss it. The Evolution of all living things, which we reserve for an Essay of its own, is a particular kind of Complex System. The study of Complexity goes back quite far, but it hit a “eureka” moment in 1776 when Adam Smith described in his classic book, The Wealth of Nations, how a free-market economy’s “invisible hand” works to efficiently distribute goods and services without central government planning. A few pages farther on we will take a closer look at free markets as an example of complex systems. The Practice of G>O>D> notes – Today, 240 years after Adam Smith, the study of complex systems remains as much about political, social, economic, and cultural systems as it is about physical and biological systems. The year 1984 saw the founding of the first research institute focused on complex systems, the Santa Fe Institute. The Institute hosts visiting scholars and scientists who collaborate “to understand and unify the underlying, shared patterns in complex physical, biological, social, cultural, technological, and even possible astro-biological worlds.” Santa Fe Institute participants have included physics Nobel laureates Murray Gell-Mann and Philip Anderson, economics Nobel laureate Kenneth Arrow, and Manhattan Project scientists George Cowan and Herb Anderson. About thirty participants are in residence at any one time, with far more assembling for summer conferences. In the last 30 years, complex systems have been modeled using mathematics, computer algorithms, statistical physics, information theory, and non-linear dynamics. We talk about how this happens in our Essay, Mathematics and Continuing Creation. Although the slime mold and other living complex systems are colorful and amazing, it is important to begin with the complex systems of crystal formation and simmering water, because readers need to understand that the Principles of Complexity are very much present in millions of such nonliving systems. Other Essays in this book, such as Mathematics and Continuing Creation, have discussed mineral crystals. Are crystals — of ice, quartz, diamond, etc. – themselves complex systems? After all, their geometric shapes show large-scale order, and that order is interesting and beautiful. The answer is that crystals are only complex systems while they are being formed; that is, when energy and materials are being supplied by flow, heat, pressure and evaporation which work to add new molecules to the facets of the crystals. When the energy and materials stop flowing, the crystal becomes a static artifact of the dynamic complex system called crystallization. Each prior layer of crystal acts as a scaffold or template for the next layer. They provide a kind of memory for non-living systems, because they permit the repetition of processes. Scaffolding, or templating, is a common principle in the Processes of Complexity. — The importance of positioning is illustrated by the wild difference between Silver Fulminate (AgCNO) and Silver Cyanate (AgOCN) — two chemical compounds, made of the same elements, but arranged in different ways (and therefore called isomers). Silver fulminate is a primary explosive that has very little practical value due to its extreme sensitivity and instability. On the other hand, AgOCN is Silver Cyanate, which is used in the production of fertilizers. It does not explode and is completely stable. Crystals form when minerals dissolve in water, percolate through rock spaces, and precipitate out. dissolving, percolating, and precipitating are all processes within a number of complex systems. Crystals grow over time because they will get larger if they have the room, the supply of dissolved materials, and a steady energy flow to drive the flow of the dissolved materials. Many other complex systems also grow, including hurricanes, bodies of law, technologies, plants and animals. If some outside force or obstruction impinges on a growing crystal, it may change direction, lose some of its geometric regularity, or become stunted. All these limiting processes are also seen in living things, weather, and culture. As we mentioned, when the energy and materials stop flowing to the worksite, the dynamic complex system of crystallization stops, leaving the crystal behind as its static artifact. Sea shells are artifacts (namely, the exoskeletons) of the invertebrate sea-creatures (complex systems) that secreted them. Other examples of static artifacts left behind by dynamic complex systems include bird nests, the Greek Parthenon in Athens, and the Mona Lisa hanging in the Louvre. (The complex system that created and left behind the Mona Lisa was named Leonardo Da Vinci. But while the process of crystal formation is a complex system, it does not exhibit the fast and radical change, the metamorphosis, that other complex systems exhibit. Next, we’ll discuss convection cells — a very common, but usually unseen, edge-of-chaos system. A simple pot of water, brought to a simmer on a stove, does present sudden structural change. When the water comes to a “simmer,” convection cells, also known as Benard cells, spontaneously emerge. Usually, we don’t see them, mostly because water is transparent. However, we can see film-clips online: Raleigh-Benard Convection. Viewed from the side of the pot, the Benard Cells are small columns of water, each one having hotter water rising in its center and colder water descending at its edges. Viewed from above, each column has a roughly hexagonal shape. The shapes are not circular, because that would leave space (unmoving water) between the columns. We are all aware of weather-related edge-of-chaos systems including whirlpools, tornadoes, “wind-devils,” and hurricanes. They all begin with the random, gentle turbulence of normal weather. Relatively quickly (over a number of days), they gather strength form their characteristic structure – the funnel-shaped vortex. Paradoxically, while all these vortex structures can inflict chaos on trees, houses, and boats, the funnels themselves are not chaotic, they are organized. It is only when the funnels decay and dissipate that the air or water resumes its calmly turbulent ebb and flow. Unfortunately, edge-of-chaos systems became known by the shorter label of chaotic systems. This semantic subtlety created a confusion that persists today. In the Book of G>O>D>, we will avoid confusion by always call these systems edge-of-chaos systems. Benard convection cells, tornadoes, and hurricanes are not alive. There are many complex systems in the universe that are not alive. While all living things are complex systems, not all complex systems are living things. The transition from one state of being to another is called by a number of names in different areas of science, including phase change, chain reaction, bifurcation, metamorphosis, punctuated equilibrium, political revolution, and paradigm shift. The Convection Cells exist on the edge-of-chaos, because a slight increase in temperature can trigger descent into a chaotic rolling boil that has no structure. But until that phase-change happens, the hexagonal cells are able to maintain their structure – they are in homeostasis. Similarly, a living human body maintains its homeostasis (its structure and its energy flow-through) until it dies, at which time the body collapses in decay. The Book of G>O>D> notes that every complex system, even a non-living one, has something akin to a “life.” It has a beginning, has an existence during which it processes materials and energy to create and maintain structure, and it comes to an end. In this sense, every complex system in the chemical and geological world is a model, a precursor, to living things. Complex systems are all around us. At one end we have the non-living Convection Cells, tornadoes, hurricanes, and whirlpools. At the other end, we have the complex systems called political revolutions. Political revolutions have happened repeatedly over the millennia, in countries all over the world. There is an energy flow moving through all complex systems. On Earth, all such energy ultimately comes from the sun. (When we burn coal or gasoline, we release energy originally created by and stored in green plants which have been compressed and heated under the Earth.) Systems that have such an open energy flow-through are called thermodynamically open systems. The Benard Cells are amazing, but not magical. They are not so inexplicable that they require us to believe that a super-human “God” reaches down into every pot of water, worldwide, and causes the cells to form. Instead, the structures self-organize, according to the laws of physics. — Similarly, ants and termites build their nests without any direction, not even from the queen. Studies show that when a sufficient number of termites are walking around, a critical mass is reached at which they begin nest-building activity. (However, each ant or termite does have a tiny bit of instinctual intelligence.) In the case of Benard cells, there is no intelligence, no central direction whatsoever. The Book of Continuing Creation says — If there is a non-human (e.g., godly) intelligence that intends the appearance of convection cells, it is acting only through its earlier creation of the laws of physics. Still, we have no objective evidence that an external Godly intelligence exists. Because they self-organize, the Benard Cells, hurricanes, ant hills, and termite mounds, are all emergent phenomena. Complex Systems have boundaries. Energy flows in across that boundary, does work, and then flows out again. The Benard Cell system includes more than the water; it also has the boundary of the pot, and the heat under the pot. Benard Cells also appear in a shallow stone-bottomed thermal hot spring at Yellowstone Park, where no human has set them up. — Each cell in the human body is also a complex system, and each one has a cell wall that separates it and protects it from outside threats. Similarly, each human being has a skin as its outer boundary, and which contains the person’s trillions of bodily cells. Edge-of-Chaos systems remain deterministic, meaning that if one knew the location of all the water molecules, all the exact dimensions of the pot, and all the exact degrees and flows of the heat, then one could, with a giant, yet to be engineered super-computer, model the exact pattern and pace of the Convection cell’s formation. But as a practical matter, predicting the exact shapes of the convection cells is (a) impossible, and (b) not worth knowing in such detail (because no one cares if one or two of the convection cells are not true hexagons, but only approximate hexagons). And if we are trying to predict the path of an even more complex system like an ecology through time, with billions of times more interacting parts than simmering water, prediction becomes inherently impossible. The only way to see the developmental outcome of an ecosystem is to let the system itself play out in the real world over real time. Self-organization occurs in a variety of physical, chemical, biological, robotic, social and cognitive systems. In addition to crystallization, and the formation of convection cells in a liquid heated from below, self-organization also happens in the rise of free market economies, and in the swarming/herding behaviors by groups of animals. The Practice of Continuing Creation says: The evolution of complex order is inherent in our Universe. The evolution of complexity, in and of itself, is G>O>D: The Growing> Organizing> Direction of the Cosmos. For our purposes in The Book of G>O>D>, the most important processes of Continuing Creation are Complexity and Evolution. Within Complexity, the most important sub-processes are Self-organization and Emergence. We will discuss all four of these a great deal in this Essay. The terms are highly interrelated, and each of them contains a number of component sub-sub-processes. Emergence is probably the most important phenomenon in Complex Systems. It is as important to Complexity as Natural Selection is to Evolution. Biology emerges on top of the foundation of chemistry, and chemistry emerges from the foundation of physics. Life, studied in biology, is an emergent property of interacting molecules as studied in chemistry, whose phenomena reflect interactions among elementary particles as modeled in particle physics. Consciousness and psychology are both Emergent from the biology of creatures’ brains. Emergence happens when the simple, often identical components of a system create some new and more complex pattern simply through their interaction with each other. Whole Areas of Science Are Emergent, as is Life Itself. The human body is made of tissues, which are made of cells, made of molecules, made of atoms, made of protons, neutrons and electrons. Trees are also made of identical protons, neutrons and electrons. But trees can grow leaves and humans can write poems — protons, neutrons, and electrons can do neither of those things. The properties of humans and the properties of trees emerge from the way in which their components are organized — from the pattern in which their components are organized. Complex systems may exhibit both structures and behaviors that are emergent. The behavior of an ecosystem is different than (but emergent from) the behaviors of the organisms living in it. The structures of some systems are determined by their constituents (e.g., the liquidity of water, discussed in Appendix B to this Essay). But other systems will have properties that can only be studied at a higher level. For example, the termites in a mound have physiology, biochemistry and biological development that are at the one-termite level of analysis, but their social behavior and mound building is a property that emerges from the collection of termites and needs to be analyzed at a higher level. Thus, universities not only teach biology, but also psychology, sociology, economics, and political science. Having presented four examples of complex systems – slime molds, mineral crystals and convection cells in simmering water, and tornadoes (plus a bit about ants and termites) – let’s step aside and talk about why such systems are so very important to people who follow the Spiritual Path of Continuing Creation. Complex Systems are vitally important to the Way of Continuing Creation because they are the natural, rational, and scientific inner-works by which Continuing Creation takes place. Continuing Creation, (which we also call The Way or Path of G>O>D>: The Growing> Organizing> Direction of the Cosmos), is itself a Complex System. It both describes and is described by all the principles and processes we will talk about in this Essay. Those principles are sufficient to establish G>O>D> as we know it, and there is no reason to take a step “beyond” and imagine an external, eternal, and all-powerful personified super-being. An understanding of Complex Systems also permits us to firmly conclude that individual people do not have “souls” bestowed upon us by a super-human “God.” What we each really have is a consciousness, a personal identity, a unique personality that emerges from the processes of G>O>D>. Your personal identity comes to you from your heredity and your environment, and nowhere else. As we discuss more fully in our Essay, Death and Continuing Creation, the “soul” is really just one’s mind, self-consciousness, and personal identity. These things reside in the brain. When the brain dies, these things turn completely off, never to return – just as they do in the very late stages of Alzheimer’s disease, even though the person’s body may well live on for months or even years. Those are the reasons why this Essay aims to impart a greater understanding of complex systems. For example, flowers form in brightly-colored patterns, in order to attract pollinating insects. Modern entrepreneurs often join together to create corporations; including a hierarchical pattern of ranks, from executives, to supervisors, to workers. Other common patterns found in complex social systems are tribal, collegial, hub-and-spoke, network, and bureaucratic patterns, all of which are studied in anthropology and sociology. Complex systems also frequently display “self-similarity,” where patterns at lower (or earlier) levels of the system are repeated at higher (or later) levels. For example, tree trunks divide into main branches, and those branches divide into smaller branches, which then divide into twigs. Coastlines are jagged whether we look at 1000 miles or one yard. We will say more about self-similarity later in this Essay. But today, we do know quite a bit about how the “Mind of God” works. More exactly, we know a lot about how G>O>D>, the Growing> Organizing> Direction of the Cosmos, works (although we certainly do not know all, and we may never know all). Today, G>O>D> is a largely understandable process which works according to laws of science that we increasingly comprehend. God was miraculous and mysterious; but G>O>D> is wondrous, natural, and increasingly understandable. The Processes of G>O>D> happen all around us, all the time. The fact that we are increasingly able to explain this process makes it more wondrous, not less. Therefore, We Followers of Continuing Creation see that God does not reach down into our individual lives, granting some favors and withholding others. Instead, we know that G>O>D> works through the processes of complexity that we talk about in this Essay. A good understanding of Complexity is vital for Practitioners of G>O>D>, because G>O>D> is itself a Complex Adaptive System – the largest one of all — and learning about it is itself a spiritual activity. To know G>O>D> is to participate in G>O>D>. The qualities of large-scale matter are emergent. Friction, for example, is an emergent quality, because friction is created when things rub together. Since friction requires more than one element, it is by definition a macroscopic behavior. Friction, in turn, generates heat, which gives us the further emergent phenomena of temperature and phase-changes like melting and gasification. Other emergent macro-phenomena include viscosity, elasticity, and tensile strength, etc. The color yellow, and all the other colors that humans see, are emergent phenomena. A spectrometer doesn’t see “yellow.” It senses colors as wavelengths – the heights of sine curves on its cathode ray tube. Waves of a certain height are seen as yellow, but only by the eyes plus brains of certain animals, including humans. Therefore, the phenomenon of “yellow” emerges from the entrance of a certain light wavelength into the eyes and brains of certain animals. The phenomenon of “yellow” is the unique product of our complex human perception system in action. Among the earliest humans, things were bartered – a club was traded for an animal pelt. Both the club and the animal pelt are directly useful to their receivers. But clubs and pelts can be cumbersome to carry around, and the specific people you meet might not need them. So, a “medium of exchange” emerged to fill the need for easier, more fluid trading. Arrowheads are easy to carry, durable, and hard to make. They are valuable because all hunting societies need them. If you want to trade a club for a pelt but the person you meet at the campfire doesn’t have a pelt, you could sell him the club for an arrowhead, and readily use the arrowhead later to buy a pelt elsewhere. Thus – arrowheads can become (emerge as) a form of money. Over time, a rich person might accumulate more arrowheads than she needs, just so she can use them as money later. After hundreds of years and the discovery of gold, gold coins would replace arrowheads as the dominant form of money. Gold is small, durable, and prized by all people, hunters and farmers alike. If the society eventually became developed enough for law and commercial trust to emerge, a rich person (such as a duke or a “banker”) would no longer need to use her coins, she could just write and sign I.O.U.’s – “Notes” – and those slips of paper would themselves become “money.” The gold coins themselves could be kept in a strong-room below the castle, “supporting” the slips of paper. Over time, large stable governments like the United States would abandon the “gold standard,” meaning that they would print paper money backed not by gold in a strong-room, but by the “full faith and credit” of the nation. In today’s world, paper money is being replaced by electronic credit-card blips and credit/debit entries made on computerized ledgers. A particularly remarkable reaction-diffusion system is the Belousov–Zhabotinsky reaction, which was studied by Ilya Prigogine, one of the founders of Complexity Science. Also, Autocatalysis takes place in many chemical reactions. A catalyst is a chemical that speeds up the reaction of two other different chemicals. It acts as a kind of “marriage broker” between the other chemicals. Autocatalysis happens when one of the two interacting chemicals itself speeds up the interaction. The analogy would be a rapid seduction rather than a brokered marriage. The “Iodine Clock,” an example of chemical solutions known as chemical oscillators, such as the “Iodine Clock,” will remain clear for a significant time after the components are mixed together. Then, the mix will suddenly change to a uniform blue. Near-synonyms for “phase transition” include the straw that breaks the camel’s back, crystallization, sudden conversion experience, tipping point, breakthrough, chain reaction, and paradigm shift. Culture, including language and music, is clearly emergent from human brains in concert with human experience. Culture –for example, the English language — does not depend on any one human brain or on any one life experience. Instead, it resided in the generations of human brains that lived down through hundreds of years; and it resides now in the English-speaking generation that lives today. Each generational set of interacting brains modifies its usage of English, causing the language to evolve over time. Modern English is very different from the Middle English of Chaucer’s Canterbury Tales (14th century), which in turn is very different from the Old English of Beowulf, a poem written down in the mid-10th century. We could say that language, literature and music have “lives of their own,” and that living humans are simply their temporary hosts. Within the overall arena of culture, there are sub-cultures and “schools of art” which are themselves complex (and evolved) systems. One such emergent system is Hip Hop Culture. Readers are encouraged to click on the Wikipedia link for Hip Hop and read the extensive and scholarly essay there. That essay almost certainly continues to explore the historical antecedents of Hip Hop, documented with over two hundred footnotes as of 7-23-18. Every artistic and cultural movement – Impressionism, Jazz, Transcendentalism, the Tea Party Movement, the Underground Railroad, Mormonism, Scientology, etc. – has a similar evolutionary history of its own, with many different creators and antecedent trends coming together to create something new and different. Open-source software and Wiki projects form an even more compelling illustration of Self-organization. Wikipedia articles are written by an army of mostly unpaid volunteers who cooperate to write and edit the hundreds of thousands of Wiki’s encyclopedia of topics. The organization of Earth’s biosphere in a way that is broadly conducive to life (according to the controversial Gaia hypothesis) is another instance of Emergence and Self-organization. See our Essay, The Evolution of Gaia and Deep Ecology. Let’s consider an oak tree — an example of a complex system where humans are not directing anything. An oak tree emerges from a seed – an acorn. Well, really it emerges from the acorn and the ground the acorn is planted in. And, if we know basic biology, the tree also emerges (we say “grows”) from the water it “drinks,” the air (carbon dioxide) it “breathes,” and the sunshine it uses for photosynthesis. Since the acorn contained DNA passed down from a chain of more primitive plants that lived hundreds of thousands of years ago, the oak tree emerged from those ancestors as well. The components of earth, water, air, sunlight and encoded DNA instructions self-assemble, they come together to create the oak tree. They combine to make a Whole that is more than – and utterly different from — the sum of its parts. The tree is more than the sum of its atoms. What has been added? Not the atoms, they have just changed form. Not energy, although energy certainly has to flow through the oak to create it and sustain it. What has been added is pattern and organization. 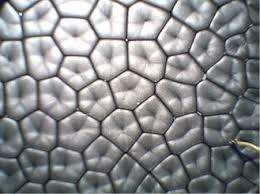 And the organization features specialization of tree tissues and cooperation among the cells and tissues. Today, we know a very great deal about how all this works; we know about morphogenesis, photosynthesis, genes, DNA, capillary action, and a host of other scientific sub-processes “explaining” the oak tree. We know the oak’s ecology, the underlying biology, the more-underlying chemistry, and the still-more-underlying physics of the mighty oak. And the detail of our knowledge greatly increases with each passing year. Our step-by-step knowledge of the oak tree’s heredity and growth has terrifically reduced the mystery of the oak tree’s chapter in the Story of G>O>D>. But that knowledge has not decreased, it has rather increased the wonder and the spectacle of this repeating creation. The mighty oak tree is a fitting symbol for all of Life, and for the entire Creative Flow of G>O>D>. Humans evolved a very early built-in tendency to see patterns everywhere we look. For example, when we look at cloud formations, we see the shapes of ships, towers, people’s faces. We also tend to see patterns (real and imagined) in events, and we love to tell stories about those events. We have evolved a high anticipation of danger, so we see danger and threat at every turn. We discuss these five traits at greater length in our Essay on The Evolution of Religion. Let’s look at additional examples of Complex Systems and also introduce Complex Adaptive Systems. As their environments change, adaptive systems are able to change themselves in an effort to survive and prosper. All complex systems require a favorable environment in which to work. For example, complex systems in physics and chemistry must have the right pressure, temperature, and energy flow. But complex adaptive systems (in particular, evolutionary systems) are able to change themselves (through mutation and natural selection) to better fit their changed surroundings. For more discussion, see our Essay, Evolution and Continuing Creation. Many adaptive systems accomplish this self-change with no central control. The queen ant does not give direct orders and does not tell the worker-ants what to do. Instead, each ant reacts to stimuli in the form of chemical scent from larvae, other ants, intruders, food and from the build-up of waste, and leaves behind a chemical trail, which, in turn, provides a stimulus to other ants. Ants also provide a fine example of sudden and swift emergence. Harvard biologist E.O. Wilson tells us that a solitary ant placed on strange ground will wander around aimlessly. Add a few more of her sister ants from the same colony, and the aimlessness continues. But when a sufficient number of ants have been added, a critical mass or tipping point is reached and suddenly the ants start to spontaneously cooperate in nest-building behaviors. The ants have undergone a phase transition from disorganized individuals to an organized proto-colony, even though their queen is not present to direct them. Clearly, this is bottom-up, self-organizing system behavior. In complex systems, even in ones made up of intelligent humans, the elements may be ignorant of the behavior of the system as a whole, responding only to the information or physical stimuli available to them locally. No one ant has an overall understanding of the colony. Truck drivers who deliver newspapers do not understand the organization and financing of the Washington Post. When wandering ants “get the message” to start building a nest, it’s like they suddenly “get religion.” A human’s religious life is also a complex adaptive system. A religious conversion is a similar example of a phase-change or bifurcation in the system. A religious conversion begins when a potential convert absorbs more and more of the doctrines, customs, and fellowship of a new faith. His or her brain is busy processing and integrating all this on both the conscious and subconscious level. Suddenly, at a tipping point, some “final straw” is added to the mix that triggers a cascade of “meaning” that jells everything together. The person experiences this as a breakthrough, “great awakening” or as being “born again.” It’s like dissolving more and more sugar into a glass of water, and then seeing the super-saturated solution precipitate a crystal. The religious conversion process is natural, not divine. People can also be mentally programmed to join cults or political parties, and then later “de-programmed” out of them. 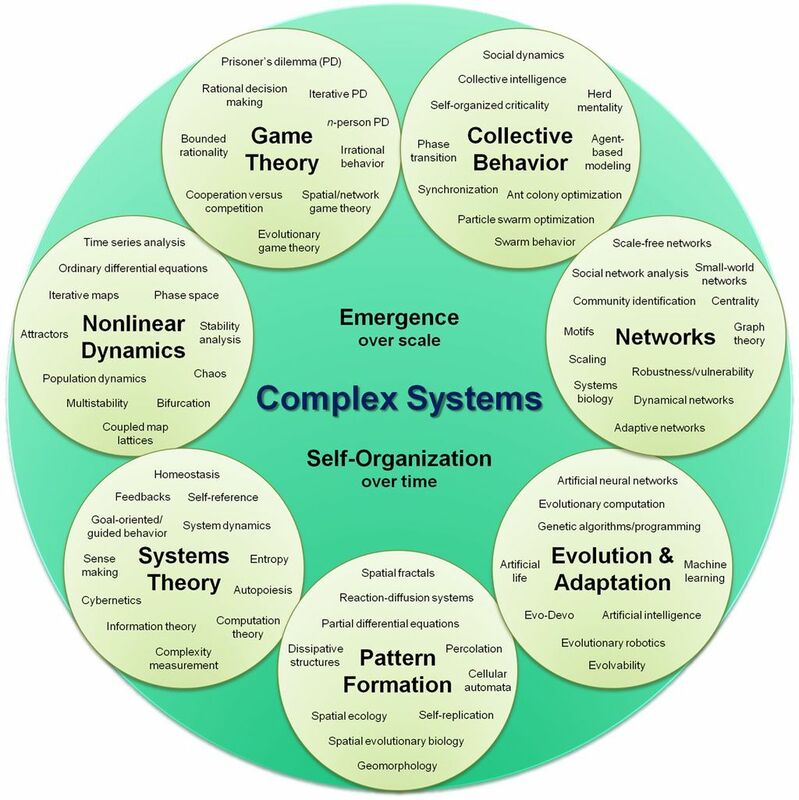 In many Complex Adaptive Systems, both the individual elements and the system as a whole are adaptive; and the system is self-similar as well in that similar behaviors take place at different levels of the system. For example, there is multi-level competition: the individuals in a tribe compete for survival and reproductive rights; while at the same time, the tribes compete against each other for survival and greater presence (increases in population, land, wealth, and influence). It is not just the sheer number of connections between components which encourages emergence; it is also how these connections are organized. Many complex adaptive systems evolve partial control systems that make the system more effective, stable, and adaptable. May have elements that are themselves are smaller complex systems. May be living systems, subject to the processes of evolution. Likely to have levels of organization; and if so, to display self-similarity. The number of elements is often so large that conventional descriptions (e.g. a system of differential equations) are impractical cease to assist in understanding the system. Interactions are rich,e., any element or sub-system in the system is affected by and affects several other elements or sub-systems. Interactions are non-linear: small changes in inputs, physical interactions or stimuli can cause large effects or very significant changes in outputs. Interactions are primarily but not exclusively with immediate neighbors, and the nature of the influence is modulated. Any interaction can feed back onto itself directly or after a number of intervening stages. This is known as recurrence. Many of these features can be found on all levels of complex adaptive systems. Cells specialize, adapt and reproduce themselves just like larger organisms do. Communication and cooperation take place on all levels, from the agent to the system level. The forces driving co-operation between agents in such a system, in some cases, can be analyzed with game theory. The Benard Cell phenomenon is a complex system made out of pure physics and chemistry, and the slime mold is composed of individual living cells. Now let’s look at a complex system that is itself made up of thinking human beings and organizations of human beings – a free-market economy. A free market economy is made up of complex systems that are themselves made up of complex systems. In a free market, individual humans, each pursuing their own self-interest, spontaneously cooperate to produce functional economies that feature efficient allocation of resources, economies of scale, and specialization of labor. The international stock market is an example of emergence on a grand scale. As a whole, it precisely regulates the relative security prices of companies across the world; yet it has no leader. When no central planning is in place, there is no one entity which controls the workings of the entire market. Investors, participating buyers and sellers must base their decisions on limited knowledge. Over time, however, market economies can evolve a degree of centralized control. Business leaders, local lords, and eventually kings built roads to connect the trading centers. Money – a complex system in itself – was invented as a way to communicate and transmit value, replacing cumbersome barter. Lenders and financiers evolved, partially centralizing major decisions about industries, technologies, and locations. Where is a thought located in our brain? Is it in a specific neuron? No. Is a piece of it in a whole bunch of neurons? Not really. The thought emerges from the interaction of a whole bunch of neurons. The partial control structures in a free market economy, or in the brain, shows them to be examples of hierarchical organization. Both hierarchy and indirect control are often characteristics of complex systems. As we saw in the example of Benard Convection Cells, there was no hierarchy, but the presence of the pot surface at the bottom of the simmering water was a kind of indirect control. We’ve seen that complex systems, often having suddenly emerging structures, can form out of simple parts. Individual ants cooperate to create ant societies and ant hills. Individual plant cells combine to form a stalk of corn. Wind, heat, and atmospheric moisture combine to form hurricanes. Under the agency of the human brain, letters are combined to form words, words to form sentences, and sentences to form the Essay you are now reading. Now we want to show that simple rules can lead to complex system behaviors as well. Examples include flocks of birds in flight, schools of fish, The Game of Life, algorithms, and computer programs. When flocks of birds fly, or when schools of fish swim, they move together in close formation. Their patterns of motion over time are both coordinated (they move together, almost simultaneously), and chaotic (there is no telling which way they might go next). In bird flocks, the complex movement pattern is called a murmuration. Clearly, the beautiful movement patterns are also excellent examples of emergence in complex systems. For example, a particular bird in the middle of the flock may see that the bird ahead of her at her “two o’clock” position, and the bird at her three-o’clock have turned about 2 degrees to the left. Our bird also sees that her companions on her left side have opened up a bit of room. So, our bird decides to change her course 2 degrees left. Click here for a video of Starlings in Mumuration. In this way, the simple parts (the birds) can form beautiful ever-changing flow patterns when directed by very simple marching orders. Mumuration behavior of bird flocks in flight is an example of the generalized phenomenon of animal “swarming.” Other species that swarm include locusts, ants, bees, and mammals that travel in herds. Herds, flocks, and schools achieve greater safety because they can look for predators in all directions, and signal danger to each other. In herds, stronger animals can patrol the edge of the herd, protecting the females and young that are in the middle. When birds fly in flocks and fish swim in schools, they confuse some predators, who have difficulty distinguishing the individual animals and/or deciding which individuals to attack. Swarming groups also clearly communicate. The birds and fish use tiny gestures. Humans exhibit herd behavior when they riot or demonstrate as a leaderless (or near-leaderless) crowd. This also happens during warfare, when command, control, and structure break down in the extremis of battle. Today, there are artificially intelligent computer systems which use similar “group-trial-and-error” applications for artificial learning and for film and television animations. One example is the Boids, algorithm/game, which mimics the swarming behavior of birds. We can further illustrate this by looking at two of the easy parlor games mathematicians and computer scientists have developed to prove this very point. The two best-known games are called The Game of Life and Langton’s Ant. These games/simulations are fun to play (or “run”) online, after just a few minutes spent studying the rules. We should note that these games are formally called Turing machines, or cellular automatons. The first name is a tribute to Alan Turing, who invented the early mathematics of algorithms, and the second was named in 1970 by its creator, the British mathematician and game theorist, John Conway. Boids is another artificial life program, developed by Craig Reynolds in 1986, which simulates the flocking behavior of birds. — A cellular automaton is defined as “a set of units in a mathematical model that have simple rules governing their replication and destruction. They are used to model complex systems composed of simple units such as living things or parallel processors. The rules are simple: Life is played on a grid of square cells — like a chess board but extending infinitely in every direction. A cell can be alive or dead. A live cell is shown by putting a marker on its square. A dead cell is shown by leaving the square empty. Each cell in the grid has a neighborhood consisting of the eight cells in every direction including diagonals. So, the Game of Life teaches us that complexity can arise from simple components following simple rules. To apply Step-one of the rules, we count the number of live neighbors for each cell. What happens next depends on this number. A dead cell with exactly three live neighbors becomes a live cell (birth). A live cell with two or three live neighbors stays alive (survival). In all other cases, a cell dies or remains dead (overcrowding or loneliness). All the changes in all the cells are done simultaneously. Then Step-two repeats the same rules to the new picture. Then Step-three, four, and so on repeatedly. A good way to get started in the Game of Life is to try out different starting patterns and see what happens. We can pick as many alive cells as we want and place them anywhere on the grid we want. Then, the game’s simple decision rules are applied to each of the live cells, causing them to change or not change, and resulting in a new “second round” pattern of live cells. Then the decision rules are applied again, resulting in a third pattern. And so on. After a number of rounds or iterations, also called “generations,” the Game often settles down into patterns called Still Life Objects (known as attractors in mathematics), which can remain the same with no further change in their pattern. No live cells die and no new cells are born. Some of the most common Still-Lifes are called the beehive, boat, ship and loaf because they resemble those real-life things. But with different starting positions, the Game of Life’s patterns can change a great deal over time. For example, the Game can evolve to produce oscillators — objects that change from round to round, but eventually repeat themselves. More rare are Gliders – patterns that move across the grid with successive rounds of the game. Most rare are the eerily life-like Complex Patterns. For example, “The Queen Bee Shuttle” first moves to the right, but after a few steps, it produces the still life called a beehive and turns back to the left. Then it produces another beehive to its left and turns right again. Such complex patterns may persist for a long time, and then disappear. Followers of G>O>D> say — The Game of Life shows that complexity – elaborate structures and movements — can arise from the simplest of rules applied to individual parts that are all alike. This is another piece of evidence showing that Continuing Creation (including our own individual lives) functions just fine without the micro-managing intervention of a supernatural Creator. Practitioners of Continuing Creation also say — that both real life and The Game of Life are “non-zero-sum games.” Because while the total energy and matter in the universe always remains fixed, within the more limited boundaries of open systems, such as our Earth, the pass-through of energy can and does build order, structure, and information content. A zero-sum game is where the winners can only gain what the losers lose. A non-zero-sum game is one where all “players,” (or most players, or the average of all players) win something. A “non-zero” result is exactly what we see when we consider that the initial sea of undifferentiated quarks and leptons were combined at the Big Bang — under the four fundamental forces of physics — to make the elements hydrogen and helium, and then again combined inside stars to make all 94 of the naturally occurring elements of the universe. The history of a complex system may be important. Because complex systems are dynamic systems, meaning they change over time, prior states may have an influence on present states. A complex system can evolve into spontaneous recovery and failure, e.g., it may build structure later collapse, and then recover to build again – in the same way or in a similar but different (evolved) way. Relationships contain feedback loops. Both negative (damping) and positive (amplifying) feedback are always found in complex systems. The effects of an element’s behavior are fed back into its system in such a way that the element itself is altered. Self-similarity is so common in nature that it must be seen as a feature of all evolution: Trees exhibit self-similarity because the branching pattern of their large limbs is repeated in their smaller limbs, and again in their twigs. The splits are never identical, but they are highly similar. The same is true for biological systems such as the branching of the circulatory and bronchial systems. Branching systems are excellent in for top-down distributing and bottom-up gathering of materials and, in hierarchical systems, for collecting information and issuing directives. The Tree of Life, illustrating the evolution of species, itself displays this self-similar branching pattern. Networks can merge into a network-of-networks. A large traffic pattern consists of many smaller traffic patterns. Cells merge to make organs, organs make bodies. Sentences are collections of words; paragraphs are collections of sentences. Long coastlines are made up short coastlines. A coastline has promontories and bays. Within every bay are smaller promontories and small inlets. And within every inlet are still smaller inlets… and so on. In 1967, Benoit Mandelbrot published “How long is the coast of Britain? Statistical self-similarity and fractional dimension”, showing that a coastline’s length varies with the scale of the measuring instrument, resembles itself at all scales, and is infinite in length for an infinitesimally small measuring device. Self-same fractal patterns like a coastline the Koch curve can now be modeled by mathematicians. You can model (draw) a mathematical “coastline” yourself – or you can see it being done online — by googling the “Koch snowflake,” (also called the Koch curve) which is infinitely long yet encloses a finite space. Systems exhibiting self-similarity are said to have fractal patterns. Sea sponges are self-similar. If someone gave us a photo of a random sponge cross-section, we could not tell if it was a large-scale cross-section or a very small-scale cross-section, because the pattern is the same at all scales. The term “fractal” was first used by mathematician Benoit Mandelbrot in 1975. Mandelbrot based it on the Latin frāctus, meaning “broken” or “fractured,” and used it to extend the concept of theoretical fractional dimensions to geometric patterns in nature. Even markets (which are complex systems created by economic evolution) exhibit fractal patterns: The swings of cotton prices and stock prices are fractal, not random: Over ten years, they tend to go up for a while (said to have upward momentum), then the trend “breaks,” and they go down for a while (said to have downward momentum). If you look at a smaller scale, say over one year, you see the same pattern. If you look over one week, you see the same pattern. Note: Because no element can be coerced to follow a specific path of assembly, no large number of elements will display the exact same pattern as another group. Patterns caused by large numbers of elements are alike but never the same. Hence all snowflakes look alike, (and the cross-sections of all sponges of one species) look alike but no two are exactly identical. It is impossible to predict exact self-similar patterns, because the variables are too many and their interactions are too random. Let’s step aside and take a further look at the implications of complex systems for people who are interested in following the Path of G>O>D>. Until the evolution of human consciousness and tool-making ability, the complex things created by the Process of G>O>D> were clearly not created “by design.” No all-powerful Designer planned and executed the pattern of the Milky Way or the organization of the human body. How do we know this? First, as we have been explaining, bottom-up processes work just fine to create complexity. Second, because the products of creation are flawed. “A number of the debilitating and even some of the fatal disorders of aging stem in part from bipedal locomotion and an upright posture—ironically, the same features that have enabled the human species to flourish. “Every step we take places extraordinary pressure on our feet, ankles, knees and back— structures that support the weight of the whole body above them. “Over the course of just a single day, disks in the lower back are subjected to pressures equivalent to several tons per square inch. Our big brains require painful birth, smaller jaws, early birth with long childhoods. Yet birds cram a lot more functionality into their tinier brains. Why wasn’t our species designed to do that? If God wanted us to be less perfect than Himself, why couldn’t he choose human imperfections that are less comic and less painful? Therefore, We Can Conclude that Humans Were Not Designed by God. Sole, halibut, and their relatives are bony fish, originally tall and narrow. Attracted by the food supply and opportunities for concealment on the ocean bottom, they flopped over on to one of their sides, and then adapted from there. Natural selection leads to huge antlers on male (bull) elk, to attract females. But it makes it very hard for bull elk to survive if cornered in a dense wood by wolves. This sub-optimal outcome is due to female choice gone overboard. Bull elephant seals are enormously outsized. In the elephant seal community, 8% of the males father 80% of the pups, thus “wasting” the reproductive existence of the other males who are the great majority that loses the competition for females. (A similar outcome happens in the Human practice of polygamy). Male Peacocks have evolved enormous tail-feather “trains” because they attract females, who “think” grandiose male displays imply greater strength, longer life, and/or better reproductive power. Even if the giant trains are correlated with those traits, do they have to be so large that the males have trouble getting around? No, but apparently once the sexual-selection algorithm is in place, it can be hard to curtail (pardon the pun). Since that time, Continuing Creation has been happening through combination, which is a bottom-up process. Small atoms combine to create complex chemical compounds. Later, small cells combine to make large and complex organisms; some of which combine to make societies. Small units of technology are combined to make structures and machines. Units of culture called “memes” combine to make law and culture. Since all these new wholes are usually unique, the processes of combination also achieve further differentiation! What powers G>O>D>’s creation of Pattern? Especially in the case of a dynamic system? Systems which construct some kind of new order, which add information and grow must be Open-Energy Systems. Open-energy systems (also called “open systems”) are systems that continually take in energy from an outside source and use it to build new pattern, new organization. Some of the energy becomes locked up in the new created thing, and the rest dissipates (usually as heat) or is excreted out. During their lives, all living things are open-energy systems. In a contrasting Closed System, (also “isolated systems”) no new energy enters the system. Whatever energy the system has works in the system for a time and then “runs out.” A wind-up pocket watch is a good example of a closed system. Once the watch spring unwinds, delivering its energy to the hands tick by tick, the watch stops. Similarly, once a car runs out of gasoline, it stops. The Second Law of Thermodynamics, called the Law of Entropy, says that eventually, everything runs down. Complete Entropy means complete disorder, lack of all pattern and structure, and lack of energy to create or repair pattern and structure. Some scientists say that even the universe will dissipate all its heat-energy and die out. Inside our present universe, however, gravity has so far worked to coalesce matter into balls large enough to ignite into stars, and this is expected to continue for billions of years. Each new star begins a new localized output of energy. Certain planets having the right composition and the right distances from these suns can use their energy flow-through to build new complex systems. Some of those systems may come alive, as they have here on Earth. Matter comes in and eventually goes out. Organized Information increases, and can last the longest. In physics, symmetry breaking is a phenomenon in which (infinitesimally) small fluctuations acting on a system crossing a critical point decide the system’s fate, by determining which branch of a bifurcation is taken. To an outside observer unaware of the fluctuations (or “noise”), the choice will appear arbitrary. In Cosmic Evolution, the Great Singularity (Big Bang) is usually seen as an instability – a weakness, flaw, or variance — from perfect system equilibrium. As we discussed just above, the human body is cursed with painful and often debilitating imperfections, while other creatures have evolved mate-attraction structures that are excessive. Also, the story of evolution is replete with organisms that evolved, lived for a time, and then went extinct. So while they may have been well-suited for their early environments, they were poorly suited to later conditions. Almost no crystal found in nature is perfect. Usually, there is a break, a change of direction, a new slant to the crystal’s axis, etc. These are caused by random changes in the crystal’s environment: by a change in the concentration of the mineral solution, in its rate of flow, by some random piece becoming an occlusion. It’s as if the crystal had a sudden, random mutation which leads it in a new, but still recognizable direction. In other Essays, we said that the Initial Singularity itself was inherently unstable, due to natural quantum fluctuations. Thus, “instability” may be the first principle of Creative Evolution. Instability leads to change — the emergence of differences. On the other hand, when enough countering influences accumulate in the system and a last, sudden triggering event causes the system to undergo a major transformation or phase change… or to collapse altogether. Instability and imperfection in a complex system can easily make the system unpredictable. Feedback Loops can increase systems unpredictability. Positive feedback promotes change, often with exponential speed, allowing local variations to grow into global patterns. On the other hand, negative feedback can dampen out an emerging pattern. Sometimes a large number of interactions may cancel each other out or create so much noise that the emerging pattern or behavior is swamped. One reason why emergent behavior is hard to predict is that when the number of components in a system increases, the number of combinations of those components increases much faster. For example, the possible interactions between groups of molecules grows enormously with the number of molecules such that it is impossible for a computer to even list the arrangements for a system as small as 20 molecules. If we were standing on earth in the age when the only living things were single-celled microbes, and if we knew everything there is to know about the Earth, physics, chemistry, and those microbes, could we predict the evolution of human beings (homo sapiens)? No, we could not – if the gigantic meteor that wiped out the dinosaurs had not crashed into the Earth, dinosaurs might still be the capstone form of life on Earth. And given the emergence of dinosaurs, there is nothing in their biology or history that would allow us to predict their extinction; or to predict the subsequent emergence of mammals, including humankind. The trend toward greater complexity would likely have continued, but in a different (random) direction. Perhaps the Velociraptors in Michael Crichton’s “Jurassic Park” really would have evolved a brain and intelligence equal to that of humans. A small mutation in just one gene can trigger a major change in evolution. If that change leads to sharper teeth, a more poisonous venom, a greater resistance to disease, better camouflage, or other competitive advantage it could lead to the birth of a new species. Provided, of course, that conditions in the environment (other creatures, foodstuffs, climate) are positioned favorably to the advance of the new species. The third reason is because living systems are open-energy complex systems. Like computer programs, once an open-energy system is started, it inevitably moves and changes. It proceeds to a new form (or forms) different from its beginning configuration. In non-living systems, like crystals, matter and information are wedded together. The hexagonal shape of a crystal closely derives from the template of the atoms or molecules that compose it. Over the centuries, however, information has become increasingly abstracted from matter. Money, as we saw, evolved from gold coins to computer blips. Our minds, along with the switches and computers created by them, are able to process information as information. The medium becomes secondary: A folk tale can reside equally well in a mind, an oral tradition, a book, a movie, or a webpage. A building may last only a few hundred years, but the blueprints for that building can last for thousands of years, first in paper form, and then as digital images in a computer memory. When the computer wears out, the design of the building can be passed to a newer computer. In this way, technology and culture can far outlive the people who created it. In the physical world of matter – of things — there is often no change without total or partial destruction. This is true even for rocks; even for geography. A plain must be destroyed in order for a canyon to be formed. A tree must die in order for new plants and insects to grow from its nutrients. When hydrogen joins oxygen to form water, they both lose their characteristics as gases at Earth-surface temperature and pressure. This general process is called creative destruction. In systems involving both physical structure and information, both construction and destruction can happen together. When an individual joins a tribe, she loses some of her individuality and independence. On the other hand, membership in the group can leverage and expand that individual’s powers. She might, for example, become the medicine-woman of the tribe. Even lowly hydrogen, when it combines with oxygen to form water, can become the biological basis for all of life. Can the Properties of Water Be Predicted? Hurricanes can be explained, but they can’t be predicted. How about the emergent qualities of water? For a long time, it was thought that even if we knew everything there is to know about hydrogen and oxygen, we could not predict the emergent properties of water. Today, the picture is less clearly defined. We also know that the full animal experience of water’s liquidity depends on the senses and mind of water’s observer. Mammalian bodies, including humans, can move through water, drink water, and likely see that it is colorless. But some animals do not drink water – they absorb it. Animals who are blind cannot see that water is clear, nor that is it transparent. Humans cannot smell water, but perhaps other creatures can. So, many emergent qualities depend on what sensory equipment the observer brings to the arena. The Whole is Still More than the Sum of Its Parts. Most importantly for Followers of G>O>D> – Whether we can or cannot predict things like the liquidity and transparency of water, the whole is still different than its parts, and still more than the sum of Its parts. Water is still utterly different than either the oxygen or hydrogen that compose it. Even if an emergent phenomenon can be fully explained by scientific knowledge of the properties and interactions of its parts, the emergent phenomenon itself is still very real. Water’s liquidity is very real. While the beautiful patterns made by flocks of flying birds can be explained by the behaviors of the individual birds, the patterns of the flock are still very real, and different-looking from the flight on one bird. Every year we learn more about how individual ants interact to create a colony – but the colony itself is still real, still different from its component parts, and in important ways very different than the ants that make it up. The Book of Continuing Creation says — If we were to know everything there is to know about O and H, and we also had fully known and experienced water itself, could we then predict that it would become the medium for life on Earth? Would we foresee that it will react with many chemicals and will also dissolve many things easily and carry them from place to place when the water is pumped by a heart? Perhaps — but this prediction would not be so easy for intelligent creatures or intelligent machines who have no blood and hearts of their own. In the mineral and chemical worlds, we can often fully and logically explain how the characteristics of a substance’s atoms produce the structure of the chemical or mineral. Information can be created by the mere positioning of the atoms in a single element. The element Carbon is a prime example. Pure Carbon naturally occurs as amorphous carbon, graphite, or diamond, depending on how the individual carbon atoms are positioned and linked. These various forms are called allotropes of carbon. A new man-made allotrope is the carbon nanotube. In a diamond, the carbon atoms are joined together on all sides (in a face-centered cubic crystal) by enormous pressure and temperatures inside the Earth, making the Diamond the hardest natural element on Earth. Carbon atoms arranged one way are called graphite. Arranged another way – they are called diamonds. But it’s the same stuff! Only the arrangement of the carbon atoms – only their pattern is different. Looking at the 2 patterns, could we predict that one is dull, soft and black, while the other is supremely hard and utterly transparent? Yes, we can. Diamond and graphite are both made up of carbon atoms, except they have different physical form and properties, due to the nature of bonds formed between the carbon atoms. Diamonds are the hardest natural substance in the world, while graphite, the key component of pencils, is soft and easy to crumble. In the most prevalent form of carbon, there are 6 protons and 6 neutrons in the nucleus. The 6 positive protons are balanced by a total of 6 negative electrons — 2 orbiting in the first (inner) shell, and 4 orbiting in the second (outer) shell. Carbon atoms in graphite are bonded in layers with only weak covalent bonds holding the layers together. When we write with a pencil some of the layers detach from the pencil lead and attach to the paper. Also, one of the four electrons in a graphite atom is weakly bound to all the three neighboring carbon atoms, and is free to move around, giving graphite its electric conductivity. Each layer of graphite is quite strong, but as a whole the substance is not. But the outer shell of all carbon atoms can hold as many as eight electrons. One way this can happens is if two adjacent carbon atoms share two electrons – one from each atom. The shared electrons take turns cycling around each of the two nuclei. This sharing pulls the two atoms very close together – it sort of “welds” them tightly together. When millions of adjacent carbon atoms all do this with all of their adjacent partners – the carbon takes the form of a diamond. The carbon allotropes display a very wide range of extremes characteristics, all of which increase the total amount of Information existing in our world. Graphite is a very good lubricant, displaying superlubricity. [ Diamond is the ultimate abrasive. Irifune, Tetsuo; Kurio, Ayako; Sakamoto, Shizue; Inoue, Toru; Sumiya, Hitoshi (2003). “Materials: Ultrahard polycrystalline diamond from graphite”. Nature. 421 (6923): 599–600. Bibcode:2003Natur.421..599I. doi:10.1038/421599b. PMID 12571587. Dienwiebel, Martin; Verhoeven, Gertjan; Pradeep, Namboodiri; Frenken, Joost; Heimberg, Jennifer; Zandbergen, Henny (2004). “Superlubricity of Graphite” (PDF). Physical Review Letters. 92 (12). Bibcode:2004PhRvL..92l6101D. doi:10.1103/PhysRevLett.92.126101. Archived (PDF) from the original on 2011-09-17. Deprez, N.; McLachan, D. S. (1988). “The analysis of the electrical conductivity of graphite conductivity of graphite powders during compaction”. Journal of Physics D: Applied Physics. Institute of Physics. 21 (1): 101–107. Bibcode:1988JPhD…21..101D. doi:10.1088/0022-3727/21/1/015. Collins, A. T. (1993). “The Optical and Electronic Properties of Semiconducting Diamond”. Philosophical Transactions of the Royal Society A. 342 (1664): 233–244. Bibcode:1993RSPTA.342..233C. doi:10.1098/rsta.1993.0017. APPENDIX B – More About the Qualities of Water: Can We Predict Them? We now seem to be able to explain why water is a liquid at room temperature at the surface pressure of the Earth: Water gets a lot of properties from the position (pattern again) of the H’s relative to the O’s. The two H’s are where the ears would be on the single “O” of Mickey Mouse’s face. So, the positive H’s are on the upper side of “Mickey’s head,” leaving the lower part of the face to be negative. In water, the H’s and O’s are joined to each other by strong covalent bonds, i.e. the H and the O share their electrons. Each water molecule is therefore dipolar – it can attract negative molecules toward the top of its face, and positive molecules toward the bottom of its face. This makes all water molecules very attracted to each other, and each one can attract four others. Once assembled, each water molecule wants to stay assembled. But the bonds between the water molecules are not covalent – they are weak and can only hold for fractions of a second. Once the bond breaks, the polarity of the molecule makes it spin and tumble about until it finds an adjacent water molecule to join once again. But wait a minute. We have explained why water is a liquid (at standard temperature and pressure), but would a scientist who has never experienced water be able to predict it? Maybe not, because one might well expect water to be a gas at room temperature and pressure due to its low molecular weight! In fact, both Oxygen O2 and Nitrogen N2 have higher molecular weights (masses) than water, and these are gases at room temperature. If we look at the hydrocarbon series, methane is lighter than water, while ethane, propane and butane molecules are all larger and heavier than water molecules; but all of them are gasses at room temperature. More amazing still is that H2S (hydrogen sulfide) which is very much heavier than water, yet H2S is a gas at room temperature. If we were to know everything there is to know about O and H, could we predict the other properties of water? Its liquidity? Its transparency? Its ability to dissolve things? Its surface tension? The answer is that yes, we could predict those things, but according to Pier Luigi Luisi 54 science does not yet have the knowledge to do that. If we were to know everything there is to know about O and H, could we predict that water would become the basis, the chemical medium, for life on Earth? Maybe – because water can dissolve, and therefore transport – so many things in its flow. But given that, could we even begin to visualize all the varied and weird plants and animals which water becomes part of? No, we could not. As The Book of Continuing Creation said in the body of this Essay — If we were to know everything there is to know about O and H, and we also had fully known and experienced water itself, could we then predict that it would become the medium for life on Earth? Would we foresee that it will react with many chemicals and will also dissolve many things easily and carry them from place to place when the water is pumped by a heart? Perhaps — but this prediction would not be so easy for intelligent creatures or intelligent machines who have no blood and hearts of their own. Steven Johnson, Emergence: The Connected Lives of Ants, Brains, Cities, and Software, 2001, Scribner, pp. 11-23. Steven Johnson, Ibid., pp. 11-17. For an excellent introduction to Complexity, see Rajesh R. Parwani, Simplicity in Complexity: An Introduction to Complex Systems, Simplicity Research Institute, 2015. See http://complexitylabs.io/. Complexity Labs is an “online platform for the research, education, analysis, and design of complex systems/. USCB Science Line, Materials Research Laboratory, University of Santa Barbara, posted April 2004 http://scienceline.ucsb.edu/getkey.php?key=4431. Tom V. Segalstad, Crystallization and Energy Relations Between States of Matter, 2009, folk.uio.no/tomvs/minerals/geo4910/Crystallization.pdf, retrieved 7/21/18. M. Mitchell Waldrop, Complexity: The Emerging Science at the Edge of Order and Chaos, 1992, Simon & Schuster, p. 33. Complexity Labs, “Edge of Chaos.” Retrieved July 21, 2019. http://complexitylabs.io/edge-of-chaos/. Ilya Prigogine and Isabelle Stengers, Order Out Of Chaos: Man’s New Dialogue With Nature, 1984, Bantam Books. Wikipedia entry for “Self-organization,” Accessed 7-15-18. Jeffrey Goldstein, “Emergence as a Construct: History and Issues.” Emergence Magazine, March 1999. 1 (1): 49–72. doi:10.1207/s15327000em0101_4. Stuart Kauffman, At Home in the Universe: The Search for the Laws of Self-organization and Complexity, 1995, Oxford University Press, pp. 71-92. Stuart Kauffman, Ibid., p. 199-201. Gregory N. Mankiw, Macroeconomics (6th ed. ), 2007, Worth Publishers. pp. 22–32. ISBN 0-7167-6213-7. “The Etymology of Money”. Thewallstreetpsychologist.com. Archived from the original on 3 April 2015. Retrieved 7-23-18. Russell Shorto, “The Streets Where History Lives,” The New York Times, February 9, 2004, 4-4-2018..
“Roundabout Benefits,” Washington State Department of Transportation. Retrieved 12 July 2017. See also Maxine Hesch, “Quantitatively Determining the Emissions Reduction Benefits of the Replacement of a Signalized Intersection by a Roundabout” (PDF). New York State Department of Transportation. Retrieved 6 October 2017. Reaction-diffusion System, Wikipedia, retrieved 7-23-18. For an excellent article about how to overcome cognitive biases, see Robert B. Cialdini, ”The Science of Anti-science Thinking,” Scientific American, July, 2018, pp 37-41. Steven Johnson, Emergence: The Connected Lives of Ants, Brains, Cities, and Software, 2001, Scribner, pp. 32-3. Emily Singer, (reporting on the research of behavioral biologist Guy Theraulaz) “The Remarkable Self-Organization of Ants: Knowing the Rules Behind Ant-made Structures Help Scientists Understand How Other Complex Systems Emerge in Nature,” QuantaMagazine, April 9, 2014. https://www.quantamagazine.org/ants-build-complex-structures-with-a-few-simple-rules-20140409/. Paul Lewis, The Emergence of ‘Emergence’ in the Work of F.A. Hayek: An Historical Analysis, King’s College, London, https://www.csog.econ.cam.ac.uk/Cambridge-Realist-Workshop/realist-images/. Examples include the Belousov-Zhabotinsky reaction (BZ), the Briggs-Rauscher reaction, and the Bray-Liebhafsky reaction. G.F. Strieder, Principles of Brain Evolution, 2005, Sinauer Associates. Partha Mitra, The Brain’s Highways: Mapping the Last Frontier, Scientific American, May 22, 1012. Christian Walloth, Emergent Nested Systems, 2016, Springer International. John Naughton, “Flocking Behavior in Birds,” in This Explains Everything, John Brockman, Editor, 2013, Harper Collins, p. 183. Eric Bonabeau, et. al, Self-organization in Social Insects, http://www.dbgroup.unimo.it/IIA/references/paper19.html. See also Stan Franklin, Coordination Without Communication, http://www.dbgroup.unimo.it/IIA/references/paper19.html. Robert L. Hotz, “Harvard Scientists Devise Robot Swarm That Can Work Together: Swarm of 1,024 Tiny Robots Works Together Without Guiding Central Intelligence,” Wall Street Journal, 8-15-14. Benoit Mandelbrot, The Fractal Geometry of Nature, 1982, W.H. Freeman and Co., p.44. Benoit B. Mandelbrot, 5 May, 1967. “How Long Is the Coast of Britain? Statistical Self-similarity and Fractional Dimension,” Science, New Series. 156 (3775), pp, 636–638. James Gleick, Chaos: Making a New Science,1987, Viking, p. 101. See the main text of this Essay, above. Richard Dawkins, The Blind Watchmaker: Why the Evidence of Evolution Reveals a Universe Without Design, 1986, W.W. Norton, p. 92. A.D. Sullivan, J.Wigginton, & D. Kirschner, “The coreceptor mutation CCR5Delta32 influences the dynamics of HIV epidemics and is selected for by HIV,” Proceedings of the National Academy of Sciences of the United States of America. National Academy of Sciences. (August 2001), 98 (18): 10214–9. Bibcode:2001PNAS…9810214S. John C. Mather, “Cosmic Complexity,” in This Explains Everything, John Brockman editor, 2013, Harper Collins, pp. 239-41. Simon A. Levin, “Ecosystems and the Biosphere as Complex Adaptive Systems,” Ecosystems, May 1998. William James, The Varieties of Religious Experience, Lectures at the University of Edinburgh, 1901 and 1902. Available online in PDF format: https://csrs.nd.edu/assets/59930/williams_1902.pdf. James Gleick, Ibid,, pp 44, 253, 258, 261. P.W. Anderson, “More is Different: Broken Symmetry and the Nature of the Hierarchical Structure of Science”, 1972, Science, 177 (4047): pp. 393–96. E.O. Wilson, The Social Conquest of Earth, 2012, Liveright Publishing, pp. 21-22. Stuart Kauffman, At Home in the Universe: The Search for the Laws of Self-Organization and Complexity, 1995, Oxford University Press, pp. 17-23. Edward N. Lorenz, “Deterministic Nonperiodic Flow,” Journal of the Atmospheric Sciences, March 1963. 20 (2): pp. 130–141. Stuart Kauffman, Ibid., p. 22. Brian Eno, “The Limits of Intuition”, in This Explains Everything, John Brockman, editor, 2013, Harper Collins, pp. 210-11. Douglas Rushkoff, “The Precession of the Simulacra,” in This Explains Everything, John Brockman, Editor, 2013, Harper Collins, p. 315. Pier Luigi Luisi, “Emergence in Chemistry: Chemistry as the Embodiment of Emergence,” Foundations of Chemistry 4:183-200, 2002.